I didn’t apply to university because I wanted to hear things I already knew. I applied because I knew I had a lot to learn. I applied because I knew a university campus was a place where my views and opinions would be challenged and examined. And they have been. I am astonished by students on this campus who can’t bear to have their ideas challenged. Shouldn’t new, or different ideas be approached with an open mind, rather than silenced? As a pro-lifer, I am excited to welcome a scholarly debate about abortion on UVic’s campus. All the activism that Youth Protecting Youth does is aimed at creating open dialogue about an issue that often leaves a trail of pain in its wake. Our wish is that students are encouraged to talk about something that is usually hidden from view, despite its relevance. I’m always happy to have a respectful conversation with those whom I disagree with. I don’t worry that someone will have the chance to lay out the pro-choice ideology, and I do not see Dr. Kluge’s generous gift of his time to engage in debate as a threat to my worldview. There’s been an impressive number of level-headed students who recognize that debate should be welcomed at a university campus, who ultimately wish to learn, with an open mind and heart. Sadly, these students tend to get overrun by those who do see a balanced representation of both sides as a threat. If a person is entirely secure in their personal ideology, then a respectful conversation should pose no problem to them. In fact, allowing the other side time to speak can do nothing but reveal the flaws in their reasoning. When people are so desperate to hinder pro-lifers from speaking at all, it reveals an inner insecurity: that, if allowed to speak, the pro-life position may actually hold water. It’s the equivalent of two children fighting and when one child realizes they’re losing the argument, they slap their hands over their ears and shout “La-la-la, I can’t hear you! Only in this case, the “children” are university students, adults, bearing angry signs, and with words a lot more vicious than “la-la-la.” It took less than one day of advertising for the debate before our club members were threatened with lynching, which was somehow put forth as the action of the progressive and the tolerant. A university should be a place where a wide range of issues can be debated. The event that will be held November 14th seeks to foster an intelligent, informed, and open campus-wide debate. Children may throw as many tantrums as they like, in the end, there’s no space for them on a university campus. The National Campus Life Network’s symposium, “True Patriot Love” was an incredible experience for me. Not as an adventurous university student traveling red eye for an exciting weekend in Toronto, but as one of many with a true common love. Yes a love for a beautiful, though far from perfect, country; yet, more importantly a love for life. We found a sense of joy in the diverse lives of everyone present, joy even in the face of great challenges and hardships. While we came together to develop and grow as “pro-life” leaders, I believe many of us were reminded of why we speak for those who have no voice. The training and discussions were invaluable as we sought to be more effective, even just as concerned Canadians trying to protect the rights of our unborn fellow citizens. From apologetics to more specific campaign strategies we learned to express our position clearly in the hope of changing minds and winning hearts. Still, through the entire packed days and late into the night, it was a message of life and love that prevailed. We laughed with a speaker at his references to his energetic young children, we cried at the testimonial of a young mother and fellow university student, but always found courage in friendship to keep our focus before us. This was a wonderful opportunity to rediscover our duty as citizens to look out for our unborn fellow Canadians, and to take heart in a love of country and life. So I challenge everyone, whether you immediately identify with the “pro-life” cause or not, to be open to the value in our own lives and in the lives of everyone person around us. Victoria, B.C. 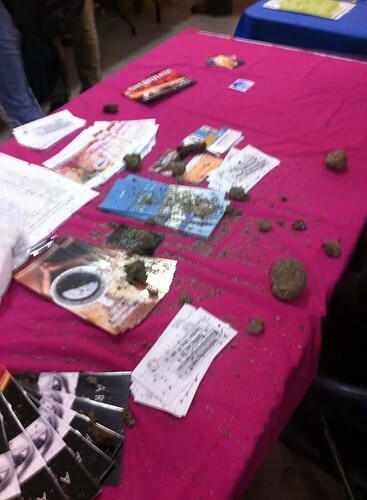 (September 11, 2014): On September 10th, two women rushed a pro-life club table at the University of Victoria, snatching the fetal models on display and dumping used cat litter all over the table. 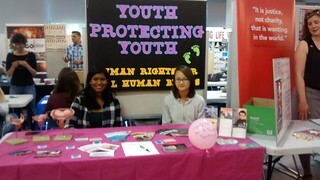 Youth Protecting Youth (YPY) was participating in the university’s Clubs Days event and had a recruitment table to sign up new members and engage with other students on the pro-life issues. Although the fetal models were recovered, club members arrived back this morning to find that the vandals had broken into the closed clubs room and that more filthy litter had been dumped on the table and the fetal models – valued at several hundred dollars – had been stolen. After speaking with campus security, club members made a police report with local authorities. The club demanded that the University of Victoria Student Society (UVSS) formally condemn the actions of the vandals, and the UVSS has agreed to issue a statement doing so. The members of YPY hope that the fetal models will be recovered, and that students who disagree with their message will learn to voice their disagreement in a mature, respectful manner. Categories: Contributions, Free Speech, Updates | Permalink.